Well, shamus lovers, it was just a few weeks back I think when I had another A.A. Fair Cocktail Talk post from The Knife Slipped, a recovered-and-printed-for-the-first-time number from the Hard Case crime folks. 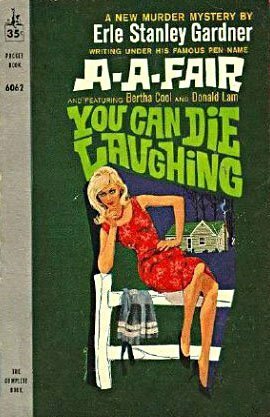 But I also just finished another A.A. Fair book, You Can Die Laughing, in old-time-y Pocket Book printing (which I love, too), and it was yet another swell Cool and Lam (Bertha Cool and Donald Lam, that is) yarn, with loads of twists and turns, a murder (or, ? ), some fun times, and some smart thinking, and some neat-ness. If you’re scouring the used racks and see it, pick it up. And if you want more on A.A. Fair and his real, even more well-known name, and such, see all the past A.A. Fair posts. But be sure to read the below B&B beauty before you head off. There was a juke box in the place and we did a little dancing. She was nice. I held her as close as I dared, and she flashed me a glance from time to time that did things to me. I knew she was still sizing me up, still leading me on. We had dessert and two B&B’s. I shuddered to think of Bertha’s reaction to the expense account if I didn’t fake it. We had another B&B, and I decided to fake hell out the expense account. 1. 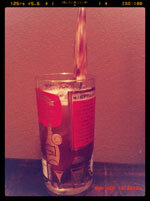 Fill a highball glass up with ice cubes. Add the cognac and the syrup. Stir once. 2. Top the glass off with club soda. Stir once again. A Note: To make your syrup in a fairly-orderly and quick fashion, muddle two cups raspberries a bit in a bowl, then add a cup of apple cider vinegar, and stir briefly. Let sit overnight (I suggest putting a napkin or such on top). Then add it plus three cups sugar and 3/4 cup water to a saucepan. Heat to a simmer, let simmer for around 10 minutes, then take off the heat and let it cool completely in the pan. Strain through a fine strainer and then cheesecloth if you’re really worried about getting small bits of things in your teeth. Keep in the fridge. I wish I could say with certainty that this drink was named after Mercurio, the 4-D Man, a fella from the planet Gramos who fought Thor and the wacky Warriors Three, as well as a bunch of other heroes and such in the mighty Marvel universe, utilizing both fire and ice powers. However! I don’t know that this drink was named after said alien, or the Mexican wrestler of the same name, or the Chilean newspaper. My guess? A misspelling of a Willy S character, or after the planet Mercury. When all is said and done, though, does it matter? 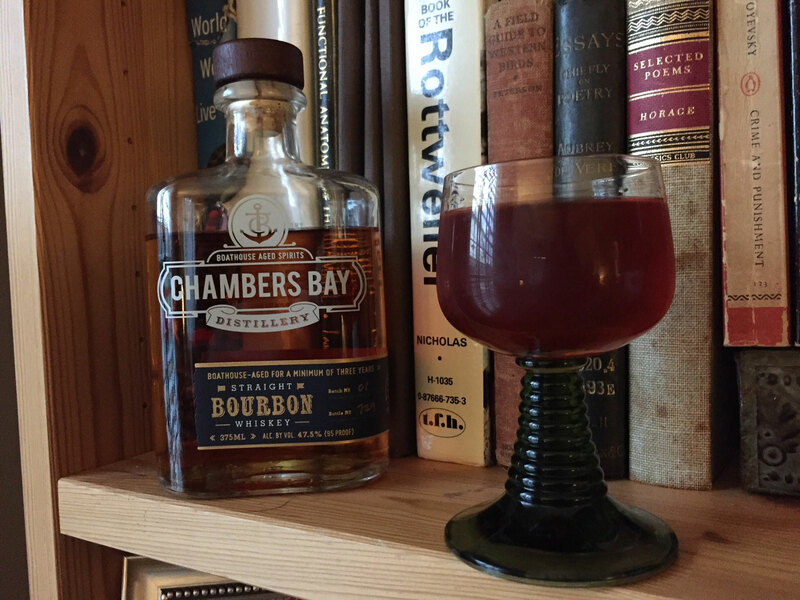 This is a swell sipper for around 10 folks, one that’s a bit bubbly, a bit brandy, and a big grape-y. Great for the end of February, when you’re just starting to feel spring might someday happen, but still chilly. Heck, they even like it on Gramos. 1. 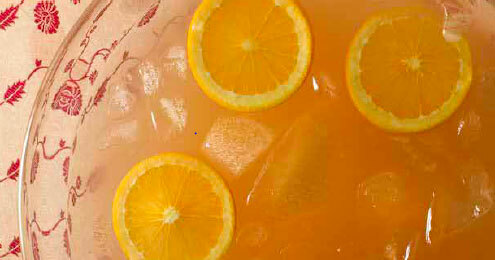 Add the block of ice to a large punch bowl, or fill the bowl halfway full with ice cubes. Add the brandy, grape juice, Benedictine, and simple syrup. Stir well. 2. Add the red wine to the cast, and stir again. 3. Smoothly add the club soda, and stir a final time (or maybe a few final times—you want to get it good and combined). 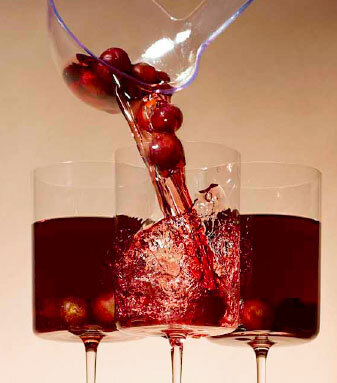 Serve in punch glasses. Let’s face it – we’re not getting any younger. Really, nothing is, I suppose. But wait, as the year rolls out into the sunset, and as a new one rolls in, let’s not get all down-in-the-mouth, and think about getting older. But instead, remember all the many wondrous days, and all the ones happening now, and how we can be youthful all year round, and many other things one might find on a card – hahaha! Or, skip all that, and sip a Happy Youth instead. 1. Fill a cocktail shaker halfway full with ice cubes. Add the Cherry Heering, the orange juice, and the simple syrup. Shake youthfully. 2. 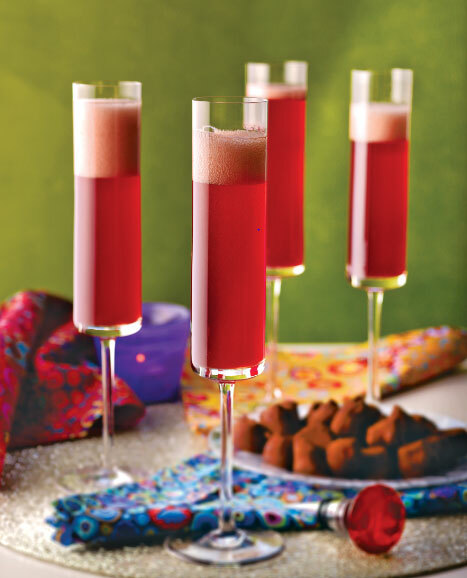 Strain the mixture equally into a four flute glasses. Top each with the sparkling wine. 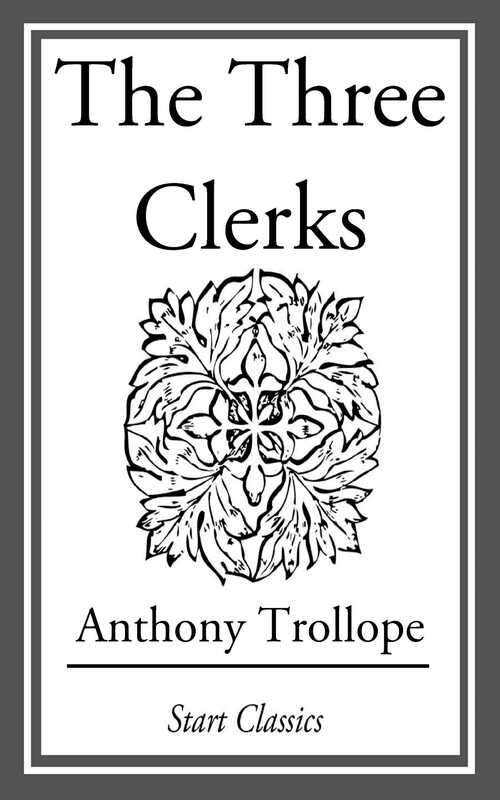 Please be sure to read the latest Cocktail Talk from the early Trollope classic The Three Clerks, entitled Part I, as well as one from much earlier, so you can get a little background-ing about me and Trollope and the book and not miss some other swell quotes. 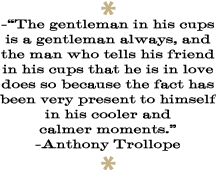 Then come back and place your peepers on the below, which highlights the bouncing Bishop. Alaric allowed himself to be persuaded and stayed. It’s the holiday party season, and you’re probably thinking, “what should I serve as I unwrap presents, or in any way enjoy the holiday season with family and friends?” Well, there are lots and lots of options, and I’m not trying to push you one way or another, but this Bombay Punch is a sure charmer, thanks to a flavorful feast of fine friends brandy, maraschino, Cointreau, apricot liqueur, and seasonal bubbly. With a little fresh orange to keep things healthy – it is the cold and flu season after all – and a lot of cheer. Again, not trying to push you, just giving you friendly options. It being the holiday season, I find it’s finest to be friendly, right? 1. Fill a large punch bowl halfway full with ice cubes. Add the brandy, maraschino, Cointreau, apricot liqueur, and orange juice. Using a ladle or large spoon, stir briefly. 2. Slowly (the bubble effect can take out your Bombay if not careful), pour the Champagne into the punch bowl. Again, this time a bit more slowly, stir briefly. 3. Add the orange slices, stir once more, and serve in punch glasses, trying to get an orange slice in each glass.